Hankook Dynapro HP2 RA33 Review: Is it Really Good? Welcome to this Hankook Dynapro HP2 RA33 review. What we have here is a high-performance all-season tire for premium or luxury SUVs. Fortunately, this also happens to be a premium tire with an affordable and friendly price. With that being said, is the Hankook Dynapro HP2 a true high-performance tire? And similar to other sporty tires, does it sacrifice ride comfort and road silence to deliver prodigious amounts of grip on a variety of surfaces? This review will answer your questions, and more. Sport utility vehicles can be fitted with many choices of tires. This will all depend on how the SUV is actually utilized on a daily basis. Rough roads will necessitate the need of all-terrain tires. But if your premium SUV is mostly driven on smoothly paved roads, the Hankook Dynapro RA33 is a valid choice. This is not an SUV tire for rugged off-road trails, although it can handle a bit of sand and loose gravel. What vehicles are perfect for the Hankook Dynapro HP2 RA33? The Hankook Dynapro HP2 RA33 is not only great for midsize luxury SUVs. It is also a great choice for smaller SUVs such as the Audi Q5, Porsche Macan, Mercedes GLC-Class, BMW X3 and X4, Volvo XC60, and even the Alfa Romeo Stelvio! OF course, the Hankook Dynapro HP2 RA33 is also perfect for the BMW X5, Porsche Cayenne, Audi Q7 and Q8, Lexus RX 350, Maserati Levante, and Acura MDX. Even smaller crossovers such as the Mazda CX-3 and CX-5, Jeep Patriot, Toyota RAV4, Nissan Rouge, Honda CR-V, and Jeep Cherokee will benefit from the brilliant all-season performance and competent handling of the Hankook Dynapro HP2 RA33. However, if you have a properly fast SUV with large turbocharged or naturally-aspirated motors and sport suspension, you are better off with a proper set of ultra-high performance tires. I’m not saying the Hankook Dynapro HP2 is not good for high-speed driving. But SUVs that demand stronger and consistent grip may find this tire to be a bit lacking when the going gets tough. 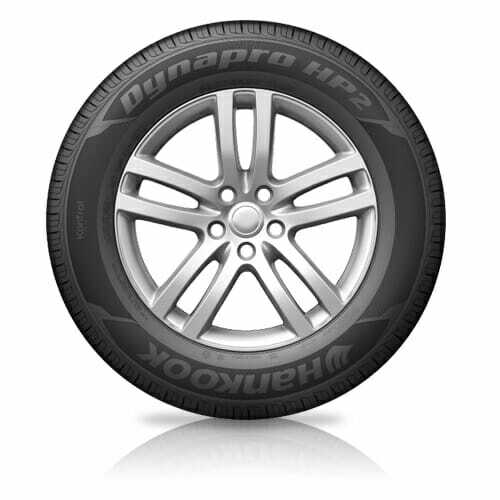 What are the features of the Hankook Dynapro HP2 RA33? Despite the conventional tread design, the Hankook Dynapro HP2 RA33 is peppered with great features. It is constructed using a high-loading silica compound to improve wet and dry traction. The compound is also engineered to provide a lower rolling resistance to deliver better fuel economy and a quieter ride. The tire comes with four straight circumferential waterways to provide better handling and confident grip in the wet. The high stiffness center rib is designed for better stability and accurate steering. The shoulders of the tire are equipped with silencer sipes to cancel out tire noise. The tire also comes with aqua slant sipes and grooves that lock together to deliver improved handling in all-season driving. 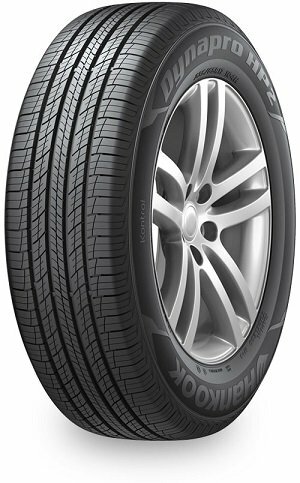 The Hankook Dynapro HP2 is also constructed to be more durable than an ordinary all-season SUV tire. The high density polyester carcass is responsible for improving the steering feedback and handling. The jointless full cover reinforced belt improves durability and high-speed stability. The tire is also equipped with a single strand bead wire to further enhance the road feel of the tire. How does the tire perform on dry roads? As expected from a high-performance all-season tire, the Hankook Dynapro HP2 RA33 is a revelation when driven on dry pavement. The braking felt strong and consistent as the tires had no problem in stopping the vehicle without slipping or sliding. Is it good for off-road driving? Unfortunately no. the Hankook Dynapro HP2 RA33 is primarily designed to be used over smooth tarmac. However, the tire is capable of handling a bit of dirt roads and loose gravel. Anything rougher or more rugged will require the services of an all-terrain tire. But Hankook knows that drivers of premium SUVs will do most of their driving over smooth tarmac and concrete. In this regard, the Hankook Dynapro HP2 RA33 will shine the most. How does the tire behave on wet roads? The Hankook Dynapro HP2 RA33 actually feels better in the wet than on dry roads. I was naturally expecting the tires to behave magnificently in the wet, but it exceeded all my expectations by tenfold. The lateral grooves, aqua slant sipes, and wide circumferential grooves will enable the tire to maintain a strong and consistent contact with the pavement even in the presence of water, ice, or snow. Speaking of snow, is the tire good for winter driving? Yes. The Hankook Dynapro HP2 RA33 not only functions well in the wet, but it can also outshine other all-season tires over light snow and ice. The tire is more than capable of finding grip on slippery surfaces to deliver better handling and control. However, all those abilities will fade slowly if driving on pavement with deep snow or thick ice. If winter driving in extremely cold climates is your primary concern, the Hankook Dynapro HP2 may not the best choice for your SUV. How about comfort and road noise? Without a doubt, the comfort levels of the Hankook Dynapro HP2 RA33 is top notch. After all, it is a tire designed for premium import and domestic sport-utility vehicles. The tire can roll comfortable over rough concrete and road undulations without breaking a sweat. Unfortunately, road noise is not the strongest attribute of the Hankook Dynapro HP2. I was expecting the tire to be quieter than I imagined, but this is not the case. The tires are silent at low speeds but will be more talkative once you reach the upper limits of the speedometer. But even though the tires produced more tire roar than usual, the noise levels are not enough to upset the refinement of your premium SUV. Continental SureContact RX Review: Does this tire fit your vehicle? Hankook Dynapro HP2 Review: Does This Tire Fit Your Vehicle? Pirelli P Zero All Season Plus Review: Does this tire fit your vehicle?